Pig iron is usually divided into steel making pig iron, cast iron and alloy pig iron according to their uses. Steel is divided into carbon steel and alloy steel according to its constituent elements. Alloy steel is a kind of steel that intends to add one or more elements to improve or obtain some properties on the basis of carbon steel. There are many kinds of elements in the steel, such as chromium, manganese, vanadium, titanium, nickel, molybdenum and silicon. People often take the output, variety and quality of steel and steel as an important indicator to measure the level of industrial, agricultural, national defense and scientific and technological development of a country. The total iron ore resources in the world are calculated to be 1964 million tons according to the iron content, including 930 tons of industrial reserves. Northern Hemisphere: total resources 123.7 billion tons, industrial reserves 60 billion tons, accounting for 63% of the world’s total reserves and 64.5% of industrial reserves. Southern Hemisphere: total resources 72.56 billion tons, industrial reserves 33 billion tons, accounting for 37% of the world’s total reserves and 35.5% of industrial reserves. Europe: the most abundant iron ore resources, the total resources of 622 billion tons, industrial reserves of 350 million tons. South America: total iron ore resources total 462.4 billion tons, industrial reserves of 188.7 million tons. North America: the total amount of resources is 444.4 billion tons, and the industrial reserves are 149 billion tons. Oceania: the total amount of resources is 191 billion tons, and the industrial reserves are 109 billion tons. Asia: total resources of 171 billion tons, industrial reserves of 102 billion tons, the last second, rather poor. Africa: the most scarce iron ore resources: 73 billion tons of resources and 33 billion tons of industrial reserves. Iron ore is used as a catalyst for ammonia synthesis (pure magnetite), natural mineral pigments (hematite, specularite, limonite ), feed additives (magnetite, hematite, limonite) and precious medicinal stone (magnetite), but the amount is very small. Iron and steel products are widely used in various sectors of the national economy and all aspects of people’s lives. They are essential basic materials for social production and public life. Since the invention of converter steelmaking in the mid-19th century, steel has been the most important structural material, occupying a very important position in the national economy, is an important pillar industry of social development, is the most important and most widely used metal material in modern industry. There are many kinds of iron ore, about 300 kinds of iron ore and iron-bearing minerals have been found, of which 170 kinds are common. However, under the current technological conditions, magnetite, hematite, magnet hematite, ilmenite, limonite and siderite are of industrial value. The Beneficiation of iron ore processing equipment is closely related to the physical and chemical properties of iron ore. Because iron ore is strongly magnetic, with the continuous improvement of magnetic separation technology, the technology of purifying iron ore with magnetic separation has been very mature. Moreover, because the magnetic separation process has no pollution to the environment, the iron ore magnetic separation technology has been popularized and applied in the major mineral processing plants. Iron ore Feeding: can be vibration feeding machine, feeding hopper, belt feeder, wheel loader or excavator feed directly. Usually will make the grizzly bar on vibration feeder or hopper to remove big waste stones firstly. 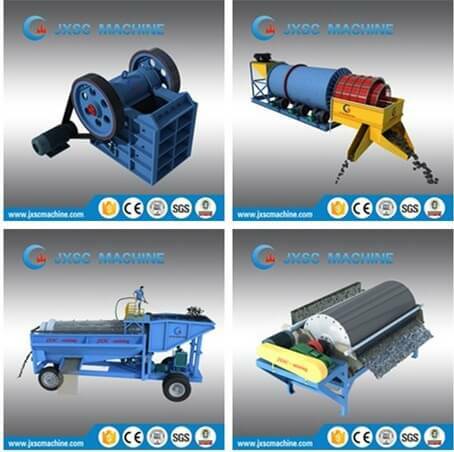 Depends on process capacity to choose suitable iron ore feeding machine. Iron ore Washing: the manganese ore washing machine is for washing clean the clay and mud in raw material, most popular used are iron ore washing trommel scrubber, iron ore washing trommel screen and iron ore log washer. Manganese ore trommel scrubber washer is for washing iron ore raw material that with many sticky clays, iron ore washing trommel screen is for wash iron ore raw material that without much sticky clay. Log washer also widely used for washing iron ore, can wash very clean the iron. 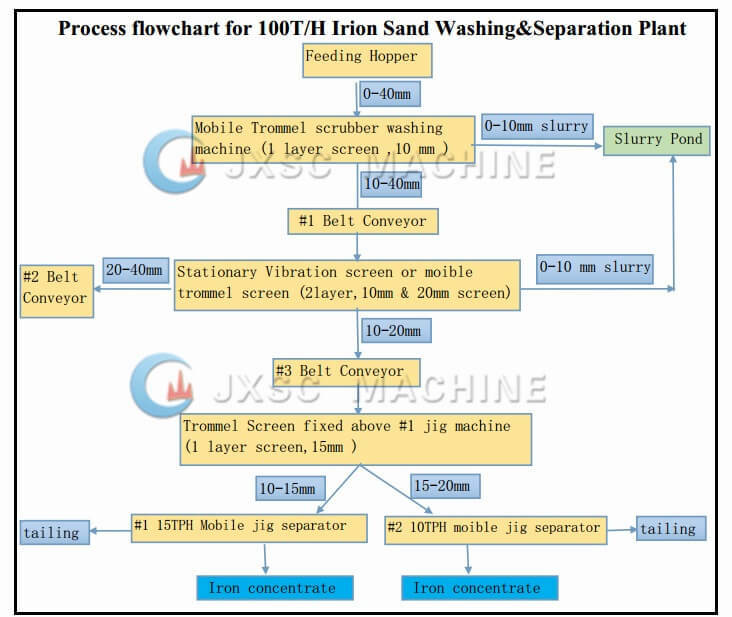 It depends on raw material conditions to choose a suitable iron ore washing machine. Iron ore Crushing: usually the iron ore feeding material is a large size, after washing, it needs to crush iron ore to proper suitable sizes, so the iron ore can be released and separate out by iron ore separation machine. The crusher type can be jaw crusher, fine jaw crusher, hammer crusher, cone crusher, double roller crusher, it depends on feeding size and output size needed to choose proper iron ore crusher. Iron ore Gravity Separation: after crush to properly needed size iron ore, sometimes will send iron ore to iron ore gravity separation process, The most commonly used iron ore separation machine is jig separator, this is the best choice of iron ore gravity separation machine. The concentrated ore discharged from iron jig separator can be as the final product, if need higher grade iron ore concentrate, can send to the magnetic separator. Iron ore Upgrading: if need much higher grade of iron ore, can use a magnetic separator to upgrade it. The iron ore magnetic separator is also an important iron ore separation machine for final upgrading. 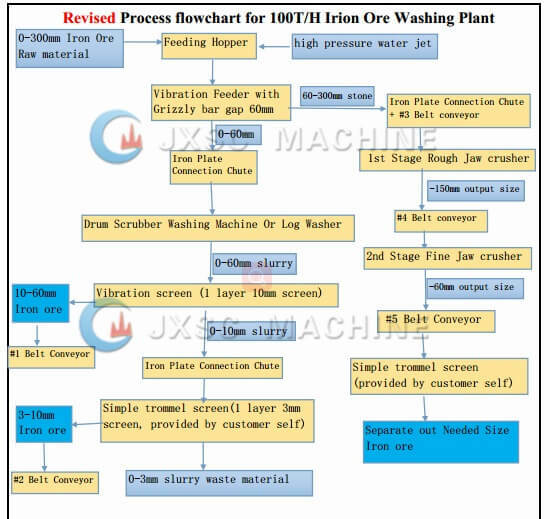 JXSC mine machinery Company in China has more than 30 years professional experience at iron ore washing and separation plant, design full set beneficiation of iron ore process flowchart, provide complete set iron ore processing equipment, can send engineers to mine site for iron ore separation equipment installation and commissioning guidance. Have already built many iron ore processing plants in Africa countries.